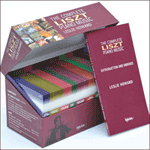 Next to Wagner, Verdi was the operatic composer who inspired the greatest number of Liszt’s opera pieces. (One hesitates to say just transcriptions, or fantasies, or paraphrases, and Liszt himself was rather lax about the distinctions between them—the rule of thumb ought to be: a ‘transcription’ is simply that; a ‘paraphrase’ is a freer version of material which remains intact in some way; a ‘fantasy’—which Liszt often called ‘Réminiscences’—is a new musical structure incorporating variation and extension.) 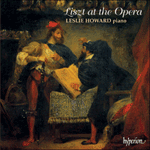 Liszt called his Aida piece a transcription, but it is surely a paraphrase, in which the religious themes are somewhat altered to make a more mystical tone-poem, and the duet is separated from the temple chorus at the end—Verdi’s ‘split level’ effect would be impossible to realise on the piano!